They have full spectrum night vision now. It’s really cool. This is an evolutionary trait allowing us to see better when outside, with green being the most predominant colour. So maybe that's why green eyes seem to change colour more than others? Anyone else read this in the voice of billy bob Thornton? I think the Germans were working on green and white, as opposed to black and white, television before WW2. Do color blind people get a different color one? Lol, green just makes me see everyone as potential enemies. I prefer black and white. Not me, I’m color blind. 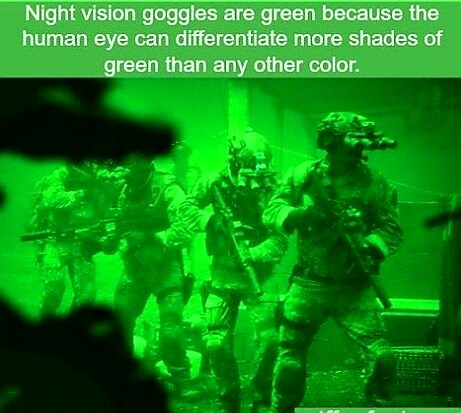 Wonder if I could see everything with night vision glasses? Lol, most high end nightvisions use white phosphorus. Green is just cheaper. If you operate w green nods your head starts to hurt after approx 5h if youre not used to it. White on the other hand you can wear for days. What is it about green? Mirrors are technically green as well. Is it just the colour most vulnerable to light? Because of evolving to hunt in the jungle.